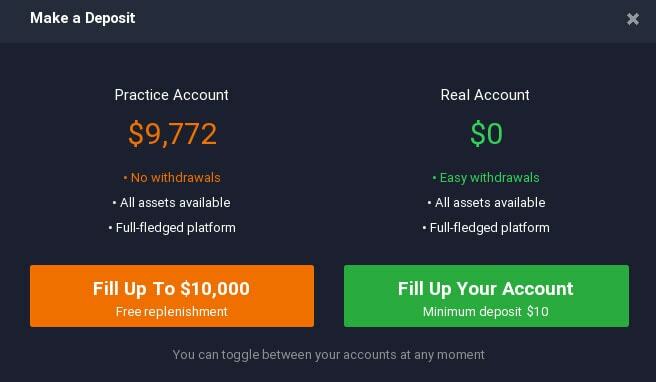 IQ Option offers free unlimited demo account without an initial deposit. The creation of a demo version at IQ Option is a matter of a few seconds, in this article we will explain to you how to open a demo account and all features that it has. Are there any fees for using IQ Option demo account? 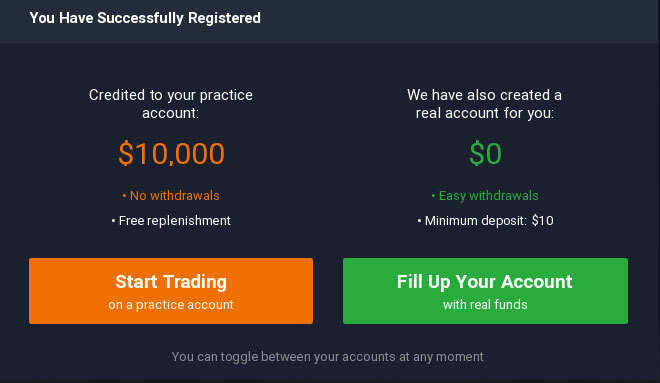 No, practice account at IQ Option is absolutely free and everyone can create it. There is also no time limit for how long you can use the account. Once you create the demo version you will get 10 000 imaginary chips to trade with. You can use them to practice your strategies or to test the platform. In case you run out of the money provided at the beginning, you can use a refill function at any time which is also free of charge. And you choose the left option, “Fill up to $10 000 (free replenishment). After that, your account balance will be immediately updated. You can use this feature as many times as you like. At IQ Option you have right from the beginning a demo account as well as a real account. Which means that you can test whatever you want at anytime you want on your demo account. And once you are ready, you just switch the demo account to a real one and you can earn real money. Switching between the accounts is possible in top right corner when you click on your account balance. With IQ Option broker, you can freely trade on the practice version every asset and trading instrument that the platform offers. Which means if you plan to trade Bitcoin as a CFD product on your real account, you can do so even on your demo. You have also access to every technical indicator, market news and video tutorials. If you need assistance, you can contact the support from your practice account by creating a ticket. The company’s background – can you trust IQ Option? IQ Option is an industry’s leading broker that has traders from all corners of the world. It has over 21 millions of trading accounts created since 2013 and is licenced by prestigious European regulator CySEC. It is currently one of few brokers that offer free demo account for an unlimited time period and without the need of an initial deposit. Real trading starts already from $10.